If you would like to receive your newsletters by email, please fill out the form below. The personal information you provide to us is used solely to process your request. We do not share this information with parties outside of BPU unless necessary to complete your request. By filling out this form, you are subscribing to our email list. 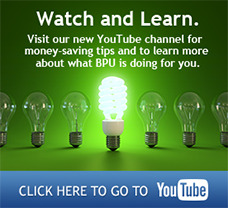 You may receive periodic emails from BPU which may include information on new programs, services, upcoming events and news from BPU that may be of interest.